Our best paid plans went AWOL just 50km inside Limmen National Park when wheel bearings shattered by too many unrelenting NT tracks sent us limping back to Borroloola on the back of a tow-truck. 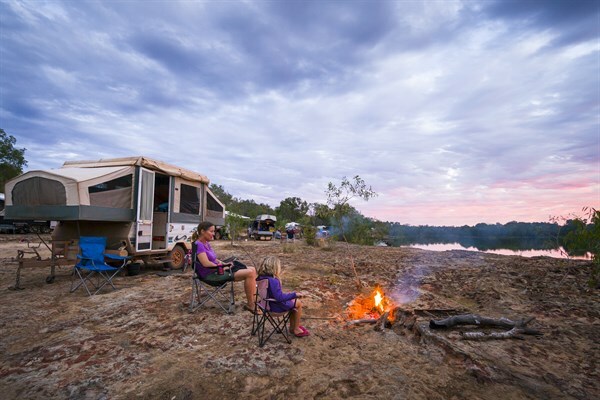 After pulling an all-nighter in the McArthur River Camper Park, we set off again for round two with tougher bearings and lighter wallets, determined to shake out the fishing rods, stoke a campfire and lose ourselves in one of the most isolated wilderness areas in Australia’s far north. Etched with deep, emerald rivers and lily-covered lagoons, Limmen protects great swathes of woodlands and towering sandstone spires. 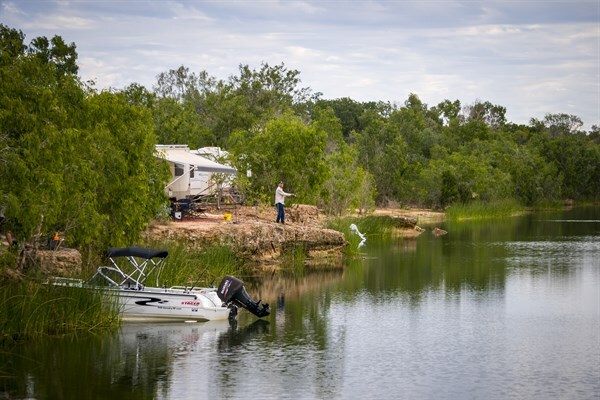 Basic bush camping and corrugated access roads help deter all but the most passionate anglers and solitude-seekers, who arrive in well-stocked, offroad rigs for lengthy stays in the NT’s remote northeastern corner. What lures them to this big patch of green is the unrivalled fishing on lurid green waterways where the crocs remind you just who rules the food chain in the Top End. 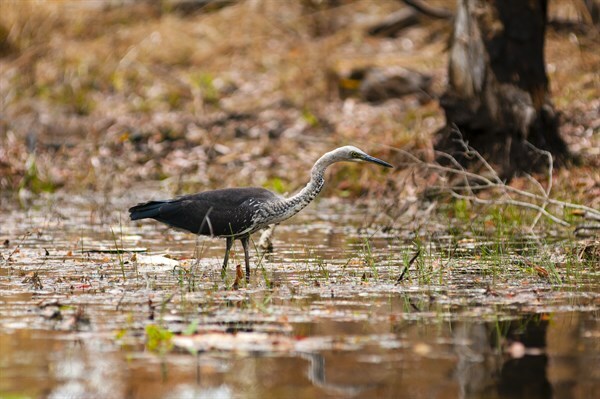 There’s uber-scenic waterfront camping and just after the wet season when roads open and lagoons retract, the birdlife is simply dazzling. Throw in some wild strolls through the Lost City’s dramatic towering rock pillars and you’ve got a whole lot of reasons to pack up and hit the dirt. Rising suddenly on the park’s southern fringe, the Southern Lost City’s dramatic cluster of sculpted domes and bulging buttresses turns golden with the rising sun, luring campers into their hiking shoes at dawn. 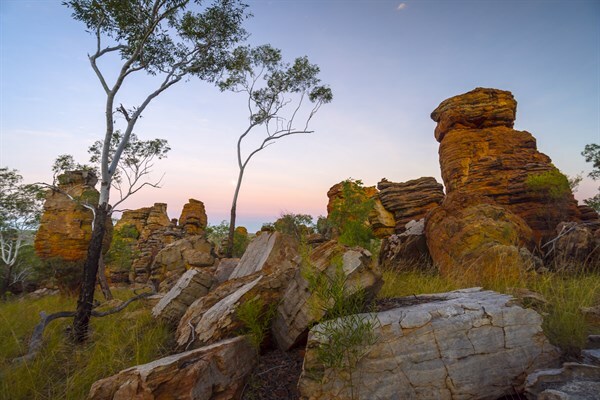 Treading a meandering, easy path, we disappear into slender chasms, squeeze past tumbledown boulders and gently climb to a grand viewpoint over the Arnhem Land Plateau to watch this multi-hued sandstone wilderness shine. From this ridgeline littered with the bright pink blooms of turkey bushes we gaze wistfully over the O’Keefe Valley to the distant and far-less-visited Western Lost City. On three visits to Limmen we’ve tried to access this remote spot, only to find the roads flooded or washed out and the entry gate locked. This undiscovered Lost City is what will undoubtedly lure me back to Limmen a fourth time, so don’t miss it if you arrive to find dry roads! Phone the Nathan Ranger Station or pull into the visitor centre for the code needed to unlock the access gate (it’s written on the whiteboard). 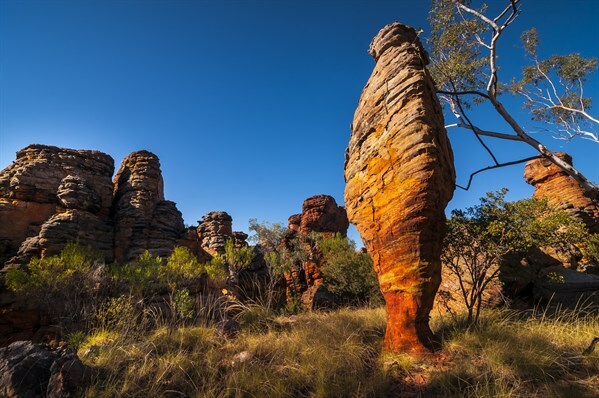 Set out early on the rugged 28km-long 4WD track and allow 90 minutes for the drive in and plenty of time to discover the Indigenous rock art and enjoy excellent walking trails. 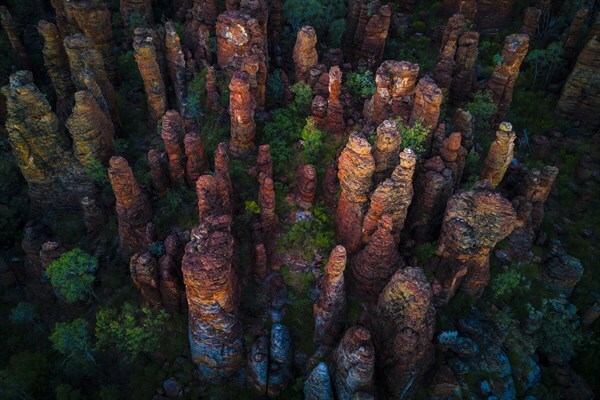 The expansive campground at the Southern Lost City is a rather hot spot with little daytime shade, but at dusk, you can stroll across the spinifex flats and climb the trail through sandstone pillars to watch short-eared rock-wallabies emerge from their daytime lairs. 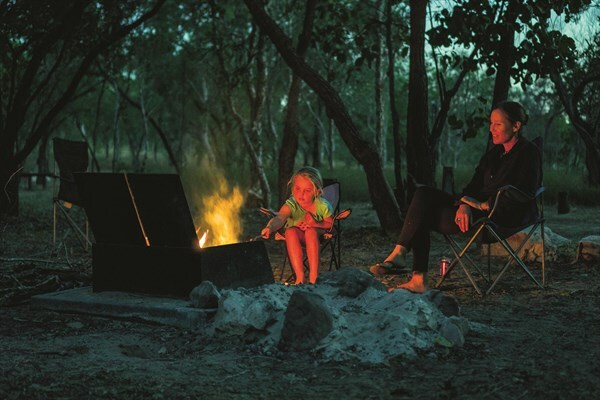 Campsites with picnic tables, fireplaces and wheelchair-accessible toilets cost a tiny $3.30 per adult (half-price for kids), and while generators are permitted, you’ll need to bring drinking water and stockpile your rubbish until your return to civilisation. You only have to travel 25km north of the Southern Lost City to reach another unmissable camping destination at Butterfly Falls. This shady oasis takes its name from thethousands of common crow butterflies that rise in spectacular, fluttering clouds from the amphitheatre’s cool, stone walls when disturbed. We watch them, floating beneath the trickling waterfall, soaking up Limmen’s only croc-free swimming opportunity as waterbirds wade amongst purple water lilies and azure kingfishers flit overhead, feeding on the wing. Around our shady campsite, sulphur-crested cockatoos feed on blooming, bright orange fern-leaf grevilleas, bending branches and filling the air with a delicious honey-scented nectar. On our most recent mid-winter visit, we shared this spacious camp with just two other rigs, even though it could easily accommodate a crowd. 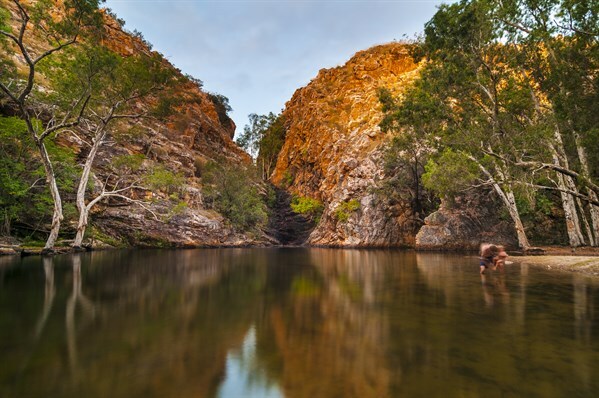 The waterhole is deep enough for a proper swim and within easy reach of the campground, which means you can wander down again and again before finally drying off and stoking up a campfire. Like every camp in Limmen National Park, this one provides wheelchair-accessible toilets, fire pits and picnic tables, all for the low, low price of just $3.30 a head. Pushing north, Towns River offers the most idyllic camping in the park, perched on the highset limestone edge of this clear, dark river. 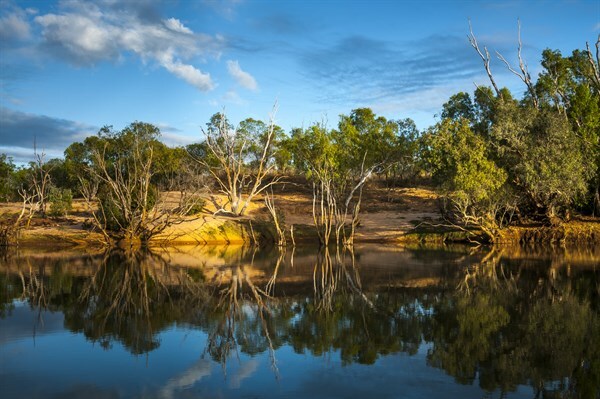 Like the Roper River, Towns River conjures up the kinds of legendary catches that lure barramundi aficionados so far down Limmen’s corrugated tracks, and it’s popular with caravanners for the hard ground and clear views. We slip through a sea of caravans to a riverfront nook just waiting for us, and spend the afternoon watching anglers reel in their fish dinners while bold black kites swoop for their share of the catch. An elderly couple warns us about the estuarine crocodiles nearby, but from our highset position they pose little danger, even as we dangle our rods over the edge. The next morning we pack up and drive on, poking down skinny tracks to discover big, blue lagoons carpeted with purple lilies, roosting magpie geese and lots and lots of ducks. We stop at Lomarieum Lagoon just behind the St Vidgeon Ruins, and ponder the wisdom of launching a kayak so early in the dry season. The boat stays dry and we spend the day on the banks of the Roper River instead. Winding for more than 1000km between Arnhem Land and the Limmen Bight, the Roper River’s translucent emerald waterway attracts the bulk of boaties to Limmen National Park. So green and clear that you can eyeball the crocodiles competing for their share of the barramundi, the Roper bears the name of John Roper, part of Ludwig Leichhardt's1845 expedition team that crossed the river at Roper Bar on a year-long, 4800km-long overland journey from Jimbour in Queensland’s Darling Downs to Port Essington on the NT’s Cobourg Peninsula. Today, four ultra accessible Roper River campgrounds attract annual wintertime pilgrims who spend time wrangling fish, talking fish and barbecuing their impressive daily catches to perfection. Travellers congregate in large numbers at Munbililla, where there are truly excellent facilities for such a remote location and most importantly, a sealed boat ramp. Along with hot water showers, toilets, drinking water and free gas barbecues, there are picnic tables and a fish cleaning station, rubbish bins and a dump point. Centralised fire pits bring campers together after all the fishing is done for the day, and you get all this for a tiny $6.60 per person, per night! Kids are half price and families pay just $15.40, which is a bargain compared to what you are asked to hand over at Darwin holidays parks! Understandably, Munbililla is a popular spot but it is well set up to cater for the numbers. Downstream along the Roper River, three much more basic national park campgrounds provide smaller clusters of campsites with pit toilets for half the price, and the pick of these is Mountain Creek for its partial shade and unsealed boat ramp. At Roper Bar itself, 200km east of the Stuart Highway, Leichhardt’s Caravan Park offersunpowered bush sites with solar hot showers ($15/adult and $10 for kids & seniors). You can launch a boat, top up food and fuel supplies, and the park permits pets on leads and generators (roperbar.com). 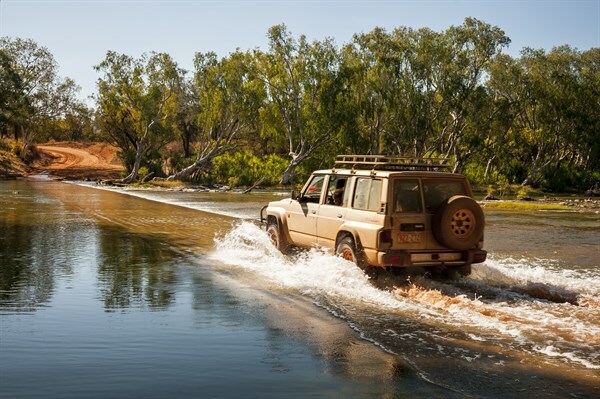 The Roper Bar causeway provides access to the Aboriginal community of Ngukurr, and a thrill for those who just want to ford it. Downstream lies the wreck of the Young Australian, a 58-tonne paddle steamer that once hauled large merchant ships up the Roper’s dangerous tidal reaches during the construction of the Adelaide to Darwin Overland Telegraph Line, and ran aground in 1872. Self-sufficient travellers continue to rave about Limmen National Park, a destination just rugged and remote enough to remind you that you’ve gone wild. 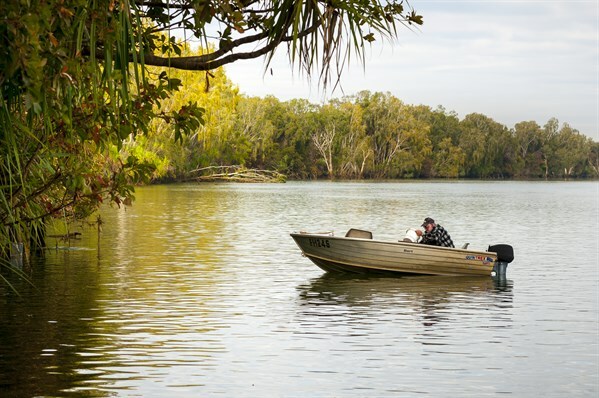 If it weren’t for the corrugated access roads and frequently flooded causeways, more travellers would be dining on barramundi at Limmen National Park’s secluded waterfront camps, so if your rig is off-road ready and you are looking to break new ground this winter, you won’t do better than a stint in Limmen.